Indonesia faces a serious threat to its human security from climate change. Its military needs to step up. With more than 17,000 islands and 80,000 kilometres of coastline, Indonesia is extremely vulnerable to climate change. Analysts believe that rising temperatures will almost certainly have a negative impact on human security in Indonesia, which in turn will increase the probability of domestic instability and introduce new regional security concerns. With this in mind, it’s important that Indonesia’s armed forces take a range of measures to prioritize environmental security, including procuring new equipment, strengthening bilateral and multilateral relations, and undertaking training for new roles and missions. Indonesians are expected to experience warmer temperatures, increased precipitation (in the northern islands), decreased precipitation (in the southern islands), and changes in the seasonality of precipitation and the timing of monsoons. These phenomena could increase the risk of either droughts or flooding, depending on the location, and could also reduce biodiversity, lead to more frequent forest fires and other natural disasters, and increase diseases such as malaria and dengue, as well incidences of diarrhoea. The political, economic, and social impact of this will be significant for an archipelago-based country with decentralized governance, poor infrastructure, and a history of separatist and radical conflict. According to a World Bank report, the greatest concern for Indonesia will be decreased food security, with some estimates projecting variance in crop yields of between -22 percent and +28 percent by the end of the century. Rising sea levels also threaten key Indonesian cities, including Jakarta and Surabaya, which could stimulate ‘disruptive internal migration’ and result in serious economic losses. Unsurprisingly, the poor likely will be disproportionately impacted by all of this. It’s clear, then, that climate change poses a significant threat to Indonesia’s domestic stability. Its direct and indirect effects threaten to inflame domestic tensions, especially if the negative effects reinforce social differences, whether they be ethnic or religious. Indonesia’s outlying islands (including Papua and Sulawesi), where ethnic and religious groups are already economically disadvantaged and politically disenfranchised, are perhaps the most susceptible to climate change-induced unrest. But the impact of climate change on Indonesia also poses a non-traditional security threat to its neighbours. In the past, haze generated by illegal deforestation in Indonesia has affected Brunei, Singapore, and Malaysia. The economic impact of two recent episodes ($150 million in 1997 and $50 million in 2006) resulted in Singapore calling for better forestry management by Indonesia. This issue could escalate given projections for more frequent and intense natural forest fires from climate change. So where do the armed forces fit into all of this? According to Maj. Gen. (Ret) Kees Homan RNLMC, ‘the impacts of climate change, particularly the growing risks of natural disasters and the damaging effects on development for already fragile states, may increase the pressure for military forces to participate in growing numbers of humanitarian assistance, disaster relief and evacuation operations.’ This is especially true in Indonesia, where the military plays a central role in maintaining internal stability. Homan has also pointed out that the international community is beginning to explore intervention in sovereign states under the principle of ‘responsibility to protect.’ This may increase reliance on military forces by states with domestic conflict zones, such as Papua, to ensure that aid is quickly provided. All this means that the military must be prepared to confront the effects of climate change – especially disaster response capabilities, which could become overwhelmed. This will require changes in national security strategy and doctrine, particularly those related to intra-military (joint), military-military, and military-civilian operations. A new strategy should be designed to contend with environmental security vulnerabilities, including physical security for basing and the threat to command and control in the event of a cataclysmic natural disaster. It should also assess staffing and suggest changes (new environmental security roles) that could strengthen the military’s capabilities. Procurement must be aligned with the new strategy and the overall importance of environmental security missions. With this in mind, particular emphasis should be placed on air transport, logistics and coordination, medical support and expert personnel. In addition, the armed forces would do well to strengthen bilateral and multilateral relationships with countries that can complement and bolster Indonesia’s forces in the case of major disasters (the United States is a good example). All this would help Indonesia’s military to build on the successes and correct the failures evident in its response to the tsunami crisis in Aceh. But climate change also introduces new roles and missions for the military. 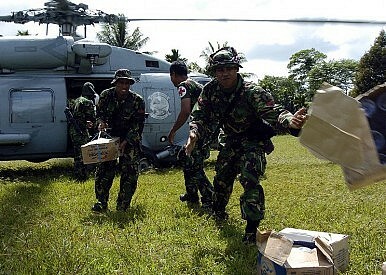 As the Indonesian Ocean (2004) and Sumatran (2005) earthquakes demonstrated, military assets will play a crucial role in natural disaster response, relief, and recovery. This means that the military should also consider: 1) Responding to remote forest fires; 2) Conducting climate change intelligence, surveillance, and reconnaissanceoperations; 3) Providing remote public health monitoring; 4) Supporting civilian science projects; 5) Supervising remote public works infrastructure projects; 6) Advising on national policies; 7) Projecting disaster relief to other ASEAN countries. With about 1 percent of Indonesia's GDP going toward military expenditure, the country’s armed forces should also introduce military procurement guidelines that significantly reduce its own environmental footprint. As the third largest global emitter of greenhouse gases, Indonesia needs such smart policy, coupled with policies to address deforestation, to minimize the global effects of climate change. Is the Philippines’ Populist Leader Embracing the Climate Change Agenda? Duterte repeatedly said that climate change was a top priority for his administration.